You are here: Home / News / Acknowledging the late George Taliaferro, the NFL’s first ever African American drafted. Acknowledging the late George Taliaferro, the NFL’s first ever African American drafted. (ThyBlackMan.com) On Sundays in the fall, the National Football League dominates much of America’s attention. Despite controversies like safety rule changes, domestic violence issues, and debates over the protesting during the national anthem, the NFL is un-deterred. Football fans still spend Sundays rooting on their favorite teams and favorite players and players like Antonio Brown, Russell Wilson, and Von Miller offer exciting plays on a regular basis. Of course, many of the best NFL players are black in a league that is predominantly black and they all should acknowledge the passing of George Taliaferro earlier this month, who was an important figure in the sport’s history. The NFL Draft is a major sporting event every year. Each year, 32 teams select, or draft, college players to help their teams and live out their dreams of joining the NFL. Other than opening day in the NFL, it is really the only time where fans of all 32 NFL teams can feel a realistic sense of optimism about the young talent that their time is bringing in. However, the NFL Draft wasn’t always the spectacle that it is now with multiple television broadcasts, guest presenters, and NFL fans screaming with anger or glee about their NFL team’s selections. Back in the 1940s, the NFL Draft was not the big deal it is now but there was history made during the 1949 NFL Draft. The Philadelphia Eagles selected future Pro Football Hall of Famer Chuck Bednarik with the first overall pick in the 1949 NFL Draft. He had an impactful and memorable career due to his tackling, toughness, and ability to play both offense and defense. As impactful a selection that Bednarik was, the 13th round selection by the Chicago Bears of former Indiana University halfback George Taliaferro which made him the first black player drafted by an NFL team. 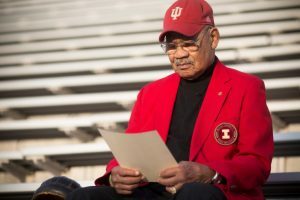 Prior to being drafted into the NFL, George Taliaferro made waves during his collegiate football career with Indiana University. He led his team in rushing as a freshman and became a first-team All-American later in college. Taliaferro was eventually inducted into the College Football Hall of Fame in 1981 because of his Indiana career. Even more impressive than his football ability was Taliaferro’s courage on the Indiana University campus during the 1940s when things were extremely challenging for African-Americans. He was subjected to blatant segregation but spoke out and acted against it. One afternoon, Taliaferro bought a ticket to attend a movie in the balcony marked by a “Colored” sign, but decided to unscrew and remove the sign and kept the sign himself. It made sense that George Taliaferro would be the first African-American drafted by the NFL. He never played for the Chicago Bears who drafted him but decided to play for the Los Angeles Dons of the All-America Football Conference. But Taliaferro did eventually play in the NFL and played well in earning three Pro Bowl selections in three consecutive years. He also showed versatility in the NFL, playing several positions, and displayed that black men could do many things to lead teams to victories on the field. The National Football League should have a moment of silence to remember George Taliaferro who passed away on October 8, 2018 at the age of 91.